Maya Van Wagenen used to be a shy, antisocial, awkward girl who attended a public school at Brownsville, Texas ( shares a border with Mexico). That all changed, however, when Maya found an old '50s book teaching girls how to be more popular. Maya signed herself up for a social experiment, following contemporary teen model Betty Cornel's advice for the entire school year, and documenting it as a memoir. This true story brought my attention to the entire genre of memoirs and opened my eyes to the world of young-adult non-fiction. Maya is a teenager with an autistic younger sibling who lives in Brownsville, Texas with her family. The city is apparently known for gang-violence, drugs and diseases. However, Maya stays away from all of that with her honest, but enthusiastic writing in her memoir. 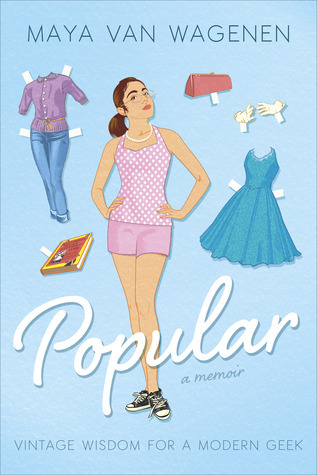 Instead she focuses on the social ladder at her public school, her social standing, her one and only friend, her struggles and her successes and most importantly, the discovery of Betty Cornell's 50's girl's guide to popularity. Maya astonishingly takes on the challenge of following the steps of Betty's book, dating back half a century, to the T, and applying them in her daily life. She divides the chapters into months, and does bizarre things such as wearing girdles and Sunday Hats. She tries out makeup for the first time, cuts down on her snacking, attempts to talk to more people and makes many friends along the way. This authentic tale of a young girl's aims at success through popularity and her discoveries is a true inspiration to all teenage writers. Maya published this memoir in her teens as a school girl, and has received world-wide recognition for her brilliance. This book is a cross between young-adult and middle-grade, but I'd recommend it to readers of both the genres. I have wanted to read this one, it sounds pretty good. I kind of want to get it for the library where I work for my students to read as well. Great review! You should definitely get it for your library- it's a great read for middle-schoolers!